Come see whether St. Paul's is the right residence for you! We'll be giving tours to future students, parents and friends during the Fall Open House. Just drop by between 10 a.m. and 4 p.m. on Saturday, Nov. 3! 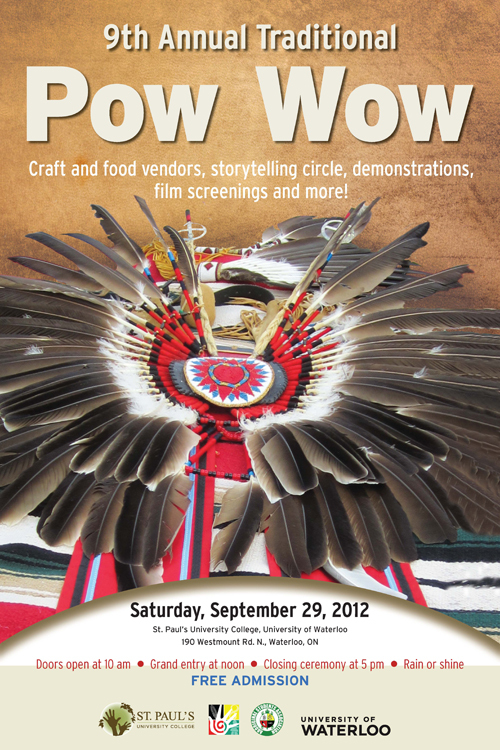 Join us for the ninth annual traditional Pow Wow at St. Paul's! The event will take place, rain or shine. Craft and food vendors will be onsite. This is an open invitation for you to drop by and see what we do, enjoy some good food, and relax with friends. For more information, please contact Ela Smith. Our annual Tree Lighting Ceremony will take place Monday, November 26 at 6 p.m.
Join us in Watson's for hot drinks, dessert and performances by the Unaccompanied Minors. Elders Dan and Marylou Smoke are available every third Wednesday of the month during the fall and winter terms. Friends of Amelie Limberger will gather at MacKirdy Hall (STP 201) to honour her memory on Saturday, November 17 at 10 a.m. Amelie was a German exchange student who died in a tragic accident in Uptown Waterloo on October 25. Read more in Waterloo's Daily Bulletin. "Indigenous Peoples and the Search for Human Security"
​Guest speaker: The Honourable Lloyd Axworthy, P.C., O.C., O.M., Ph.D.
Join alumni from Across the Creek – St. Paul’s, Conrad Grebel, Renison, and St. Jerome’s – for an evening of fun, including a pre-curtain reception at 7 pm with Professor Ted McGee of St. Jerome’s University, who will share some background of this classic comedy. Environment Living-Learning Community students: Come out to the Faculty Reception on Wednesday, October 10, from 3:30-4:30 pm in the St. Paul's Chapel. Meet your profs and have some food! This Roundtable features Frank 'Many Horses' Austin. Writing a Paper -- What Do Profs Want?